Lawn care, irrigation, weed and pest control - Lake Arrowhead, Big Bear, Crestline, Running Springs"
Let the professionals at VB Landscaping take over your Lawn Care. Enjoy your lawn without having to work at it! BUILDING A LAWN - If your lawn suffers from soil compaction, weed problems, heavy thatch, or nutrient and organic matter deficiencies, you may want to remove your existing turf and replant your lawn. That's a big job, but like a new roof, your new lawn will last a long time. There are four ways to replant a lawn: by applying seed, planting either sprigs or plugs, or laying sod. CHOOSING THE RIGHT GRASS - Choosing the right grass can make the difference between having a low maintenance, environmentally friendly lawn and one that is susceptible to disease, pests, and weed invasion, and that requires a lot of upkeep. The type of seed you choose for either a new or restored lawn depends on many factors, and our lawn experts can help you make the right decision. FERTILIZATION - Grass has been around for a long time, and it has done pretty well on its own. For example, think of a meadow where the grass looks great. But, it only looks great from afar. A closer inspection reveals bare spots, weeds and unsightly "scars." We expect more from the grass in our yards. It's not a meadow. It's part of our home, and the grasses growing in a meadow often are not ideal for a home lawn. When we mow, we cut off a great deal of the plant, and grasses compensate for this loss by growing new shoots. This comes at a cost to the plant, and fertilizing can help provide the necessary nutrients the grass needs to develop a thick, green turf. Lawn owners can also help grass combat heat, insects, dry weather, foot traffic and constant mowing by giving the grass what it requires - a generous supply of the proper nutrients. And, in order to achieve optimum results - and have that thick, green lawn we expect to have surrounding our homes - it is important to provide those nutrients year round, and that's what we do at VB Landscaping! 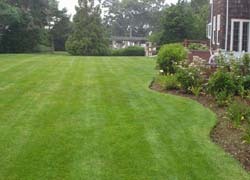 LAWN MAINTENANCE - Let VB Landscaping maintain your yard. We will fertilize it, mow it, trim it, water it, weed it, and repair it as needed. Your job is to ENJOY IT! WATER CONSERVATION - Efficient watering and common sense saves this precious resource. Experts estimate that Americans use more than 400 billion gallons of water per day. On average, homeowners use 50 to 70% of their water outdoors, sprinkling lawns and gardens. Here are the top ten tips to help conserve water right in your own backyard. 1) Put a layer of mulch around your plants. This helps to retain moisture and prevents evaporation. 2) Install a drip irrigation system around your shrubs, hanging baskets, flower and vegetable gardens. Drip irrigation systems use 50% less water than conventional sprinklers. And, they're more efficient because they deliver the water slowly and directly to the plant's root system. 3) Install a home irrigation system with a rain sensor. Many states and local water districts now require rain sensors. Homeowners who have irrigation systems use less water on their lawns and gardens than those who don't. Watering efficiently, and only when your plants and lawn need it, can save a great deal of water. Rain sensors interrupt the watering program if it rains, saving even more water. 4) If you already have a home irrigation system, make sure you're getting the most out of your timer. New technology makes it easier than ever to program and monitor your watering needs. Consider upgrading your timer. Automatic, programmable timers save more water than mechanical models. 5) Don't fertilize during hot, dry weather. Applying fertilizer can actually enhance drought problems. When you do feed your lawn and garden use a slow release fertilizer. 6) Raise the blade on your lawn mower. Closely cropped grass requires more water. 7) Recycle your grass clippings back into your lawn by using a mulching mower. You'll not only conserve water, you'll save time while mowing. 8) Cut back on routine pruning. Pruning stimulates new growth, and new growth requires more water. Only prune your plants when it wilts or leaves die out. 9) If you use a hose and portable sprinkler, buy a hose end timer to regulate your watering time. 10) Sweep your sidewalks and driveway rather than hosing them down. WEED CONTROL - A weed is really best defined as a plant growing where you don't want it. That can include tall fescue growing amid Kentucky bluegrass or the drought-proof flowers of yarrow spreading beyond the flower border. Because weeds are survivors, designed to make a go of conditions that don't favor most other plants, they will always be with us, looking for a chance to establish themselves. Rather than cast a disparaging eye on anything growing in the lawn other than your chosen lawn grass, you are better off accepting that diversity is a fact of nature. Your task is to decide which weeds you can tolerate and which must go, whether because they are too noticeable, overly aggressive, or a health hazard, like poison ivy. Whatever the weed, if you don't want it, let VB Landscaping get rid of it! PESTS - Insect problems, like diseases, are apt to develop when conditions are favorable to them. As the weather warms up, insect populations and activity increase. Your first and best line of defense against these pests is to provide optimal growing conditions for your lawn. The objective is to cultivate a thick, healthy turf which isn't overly attractive to pests as either habitat or food. Being more resilient, such lawns are also better able to survive the inevitable foraging of insects.